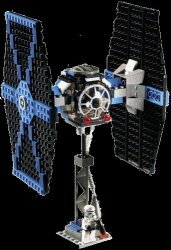 Another Star Wars Lego kit hits the street and this time it is the turn of the Empire to receive its own Lego Tie Fighter complete with pilot and stormtrooper figures. Those sad individuals who are Star Wars collectors will no doubt complain that this model is not authentic (apart from the fact it is made of little plastic bricks and it is too small for them to sit in it.) Horror of horrors, it is the wrong colour - shouldn't it be white? Only Darth Vader's ship was black! Whatever! This is one of the easiest in the range to construct and most Lego nuts should have this completed within the hour. As usual there is the same excellent standard of detail that we have come to expect from Lego. This kit will have kids and adults alike in their element.